Michael Nakasone was appointed bandmaster of the Royal Hawaiian Band yesterday by Mayor Mufi Hannemann. Once confirmed, he replaces Aaron Mahi. Michael Nakasone, who has led the Pearl City High School Marching Band to the prestigious Tournament of Roses and Macy's Thanksgiving Day parades, will strike up the Royal Hawaiian Band as its new leader. Nakasone replaces longtime bandmaster Aaron Mahi, who was not reappointed to the post by Mayor Mufi Hannemann. Mahi has been the director of the Royal Hawaiian Band since 1981. "Mr. Nakasone has what I believe is the musicianship, the leadership and proven fund-raising skills to be an excellent bandmaster to replace Mr. Mahi," Hannemann said. Mayor Mufi Hannemann has named Wayne M. Hashiro as the director of the city Department of Design and Construction, which oversees the city's construction projects. Hashiro was previously named the deputy of the department but Hannemann moved him up to the director's spot after a few weeks on the job. "I was also able to see Mr. Hashiro's performance first hand. Very impressed in the short time that he's been there to handle a multitude of very complex issues," Hannemann said. 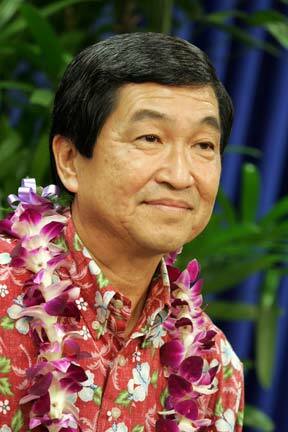 Hashiro, a civil engineer and former manager with the Army Corps of Engineers, replaces outgoing Director Tim Steinberger. Nakasone, 60, has been a music educator with Pearl City High School for 28 years and the only bandmaster to be named state Teacher of the Year. Nakasone has taken the acclaimed Pearl City High School Marching Band to several high-profile international events, including four appearances at the Tournament of Roses Parade in California, three in the Macy's Thanksgiving Day Parade in New York and performances in Canada and Japan. He begins his new job Feb. 16, although his appointment is subject to City Council confirmation. Nakasone's skills at helping parents and students raise millions of dollars over the years to finance mainland trips for the school's bands were a big plus in his selection for the $99,800-a-year post, said Hannemann, who wants the city to find ways to partner with the private sector to finance public services. "I'm very, very grateful for everything that Aaron Mahi has done," Hannemann said. "There's no question he was a great bandmaster and someone who put his own imprimatur on the Royal Hawaiian Band." Most of the Royal Hawaiian Band members criticized Mahi's abilities as an administrator and band leader and called for his replacement. Mahi's name was not among the three sent to Hannemann from a committee screening applicants for the band director's position. Hannemann said if Mahi's name had been among the applicants, he probably would have reappointed him. "But it was clear to me that the process was fair, it was thorough, it evaluated all aspects of being a director and not just the bandmaster, being a leader," Hannemann said. "When you have an individual who has become synonymous with a great institution, it's extremely, extremely difficult to make changes," said Joe Pickard, who headed the search for Mahi's replacement. "When you do that, certain individuals or certain sectors of the community are naturally disappointed." Pickard said the committee was looking for change, "someone who would invigorate the band, that would go out there and have the energy, the vision to really make the band what it was intended." Nakasone said he knows most of the band members and he is confident their relationship will help them get through any issues raised by Mahi's departure. "Since I know a lot of them, I really feel they will give me great support to succeed," Nakasone said. "At this time, I'm not really worried about the problems and the morale problems at the Royal Hawaiian Band. I think when I get to do the job, express my goals and everything else, I'm sure that we can succeed." His appointment is being well-received. "I congratulate Mr. Michael Nakasone," said Eric Kop, a 16-year band member of the Royal Hawaiian Band. "I believe he has the band's best interest. Yes, I think he will be supported (by band members)."